The picture, here, is of two houses in the midst of a storm. One is built on rock and one is built on sand. One house weathers the storm; the other house is destroyed. Some of Jesus’ parables do not require interpretation because Jesus explains the meaning of them for us. Perhaps this is so, in order that we do not miss what He is trying to say. Jesus explains this parable, saying that the one who hears Jesus’ teaching, and does not follow it, is the one whose house collapses. Further, the one who hears Jesus’ teaching, and follows it, is the one whose house stands through the storm. This parable is about builders and the choices that they make. You may, or may not, be a house builder in the natural, literal use of the term. However, friend, did you know that whether you are a contractor, framer or construction laborer, or not, you are a builder. You are building your life. With every day that passes, you are building, shaping and forming your beliefs, values, convictions and purposes for your life. You are also building friendships, relationships and, maybe, a family. For a moment, think of all of these things as being a part of your house. Your life is your house. Who you are, as a person, is your house. Your house may be small or it may be a mansion. Your house may have fancy framing, have custom and intricate architectural design, or it may be basic and plain. What is of primary importance to every house is its foundation. In fair weather, bystanders or passersby may not know what kind of foundation was used for any house. However, the builder knows. The builder knows whether he built on firm foundation, or on poor. Even though the bypassers may not know what the foundation is in fair weather, they will know in time. All know, in time, because the storm is coming. In Jesus’ parable a great storm comes to each house. Use your imagination to picture this storm. This storm has torrential rain, winds with hurricane velocity and flood waters overflowing their usual boundaries. Both houses are under a fury of severe pelting, beating and battering from the elements. Is this not how life is? Life is hard, filled with disappointments, losses, heartbreaks, violations and abuses. Sometimes, life’s hardest dealings come all at once, back to back, with little or no intermission between them. In the midst of these calamities, many people collapse. You can collapse mentally. You can collapse spiritually. You can collapse financially. You can collapse emotionally. You can collapse eternally. You can have everything stripped away from you, even your sanity, in the midst of life’s storm; that is, you can have everything collapse if you have built your house on sand. Building your house on sand is hearing Jesus’ words and saying, “That’s not for me. That may be good for somebody else but not for someone like me.” Building on sand is saying, “I will consider Jesus’ words at some future date after I have lived a full life for myself.” Building on sand is hearing Jesus’ words and being offended at the claims He makes on your life. It is being offended at His call for you to surrender to Him and give Him your life. It is being offended and not repenting. Building on sand is saying to yourself, “I am a good person and don’t need God ruling over my life.” Building on sand means having your house/life flattened when life’s storms hit. However, although one house in the parable fell, there was another that did not. Why? The surviving house/life was the one which was built on the rock of hearing Jesus’ words and obeying them. This house was also subjected to storm. Becoming a follower (obeyer) of Jesus does not make your life smooth and carefree. To the contrary, conflict, crisis and pressures are poured out on the Christian also. However, what a difference in the outcome of this house/life! This builder heard the words of Jesus and recognized the value that Jesus’ message had, if it was lived out. This builder heard the words of Jesus and realized that, contained therein, was everything that he needed to build his life upon. He eagerly began building his life on this foundation. Is it easy to build our lives on the teachings of Jesus? Jesus did not say that it was. Although we are not told, here, I imagine that the builder, in order to find this rock foundation, had to go to a rocky place. Perhaps he had to climb up and down a mountain, carrying supplies and building materials. Perhaps he had the strain of carrying materials around jagged, seemingly impossible, sections of the climb to get to the rock slab that he was looking for. Perhaps it cost him everything to build his life/house on this foundation. The other builder built on the flats, on the flood-plain and upon sand. His life/house went up easy and fast. However, it came crashing down just as fast. How about you, builder? What have you built your life upon? 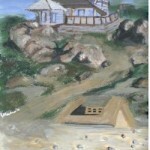 What foundation is beneath your life/house? Examine yourself. You may have had many breaks in life and you may have many things going for you. However, the fair weather is going to change. When it does change, foundation is everything. Are you following Jesus Christ through life? Are you connected to Him? Friend, Jesus Christ died for your sins and for mine. He paid a terribly painful price that your life and mine would be saved. He died for us, and then He rose again from the dead. Now, because of what He has done, you can be forgiven and saved and brought into His kingdom. Will you accept this and now start building your life/house on Jesus and His Word? Perhaps you are saying, “I am older. I have already built my life and it has not been upon Jesus’ teachings.” Start over! That is right, start over! Count your sand-castle life as a total loss and start over with Jesus. You are privileged to have heard this call in time. You may be saying, “I can’t change my life now. I have traveled too far down the path that I am on.” You can change, not by your own power, but by God enabling the changes that need to come. You can make a decision today to put your life in Christ’s hands and give up your self-rule. Jesus’ words have come to you. Do not make the mistake, of not heeding them. Jesus’ words are for you to build your life/house upon. You may say, “I don’t know how to change.” You may not understand all that needs to change in your life but you can fall down before the Lord and cry out to Him. You can make a commitment to following Him and ask Him for the ability to live that commitment out. This does not mean that you will never fail. What this does mean is that the direction of your life has changed from going your own way to following God’s way. There will be much grace and much forgiveness, along the way, but your direction needs to be one of following Christ. That direction is set in moments of decision, such as this, when you choose to surrender all of your life to Jesus Christ. Will you choose the way of Christ? Will you be transformed? Will you become a new person with Christ dwelling in your heart, Christ sitting on the throne of your heart, guiding your actions and life? You can begin a new life today, one with the peace of God abiding within you. You can begin a life clean and new by the grace and power of God. Will you choose this? Lord Jesus, I have been building my life all wrong. I have been acting like I don’t need You. I see how wrong I have been. Life is not a casual thing. Life is serious, and I want to be serious in building on a foundation for my life which will stand throughout the storm. Jesus Christ, You alone have what I need. You have the remedy and You offer the forgiveness that I seek. Forgive me for running from You. Today, I stop running and I surrender to You. Today, I choose to obey Your call. Jesus Christ, You died for me, for my sins and then You rose from the dead. I believe this. Forgive my sins, every one of them. I fully surrender my life to You. I want to follow You from this day onward. Give me the direction and strength to live this out. Thank You. Amen. Booth, Catherine. Papers on Godliness. The Salvation Army Supplies and Purchasing Department. Atlanta. Hendrickson, William. New Testament Commentary : Exposition Of The Gospel According To Matthew. Grand Rapids : Baker Book House, 1979.